Researchers at University of Toronto and the Swiss Federal Institute of Technology Zurich (ETH Zurich) have recently published a paper that claims exotic plant species do indeed eliminate native plants from the wildlife ecosystem, contrary to previous reports that found the threat unreal. The ecologists argue that reports heralding invasive plants as non threatening are based on incomplete information, since not enough observational time had been granted. The researchers claim the impact invasive plants has on a native ecosystem isn’t felt immediately and requires some time before they dominate the habitat – a steady but sure fact. The whole conundrum comes from the fact that very few species have been found to become extinct as a result of exotic species. What happens, however, is that often native plants are moved out and forced to survive in patchy, marginal habitats unsuitable to their nonnative competitors. “Of particular concern is the possibility that short term persistence of native flora in invaded habitats masks eventual extinction,” says co-author Jonathan Levine of ETH Zurich. 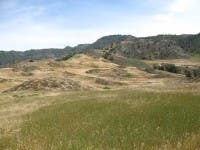 The researchers visited the California reserve, a well known ecosystem to ecologists where the remaining native plant diversity can only be found in the marginal areas surrounding non-native plants. After performing experiments and gathering data, the scientists performed a quantitative model in order to determine what long term impact invasive plant species have on the local ones. “Our research also allows us to identify how new habitats for native flora could be created that would prevent extinction from happening. These habitats would still be too marginal for invaders, but placed in such a way as to create ‘bridges’ to other habitat patches,” says Gilbert.